The Focke-Wulf Fw 189 Uhu ("Eagle Owl") was a German twin-engine, twin-boom, three-seat tactical reconnaissance and army cooperation aircraft. It first flew in 1938 (Fw 189 V1), entered service in 1940, and was produced until mid-1944. Not to be confused wtith the Heinkel night fighter of the same name. In 1937, the Reichsluftfahrtministerium (RLM) issued a specification for a short-range, three-seat reconnaissance aircraft with a good all-round view to support the German army in the field, replacing the Henschel Hs 126, which had just entered service. A power of about 850-900 hp (630-670 kW) was specified. The specification was issued to Arado and Focke-Wulf. Arado's design, the Ar 198, which was initially the preferred option, was a relatively conventional single-engined high wing monoplane with a glazed gondola under the fuselage. Focke-Wulf's chief designer Kurt Tank design, the Focke-Wulf Fw 189 was a twin-boom design, powered by two Argus As 410 engines rather than the expected single engine and a central crew gondola, while Blohm & Voss proposed as a private venture something even more radical: chief designer Dr. Richard Vogt's unique asymmetric BV 141. 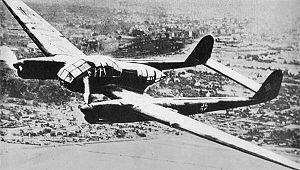 Orders were placed for three prototypes each of the Arado and Focke-Wulf designs in April 1937. Possibly the best reconnaissance aircraft to operate during World War II, the Fw 189 was produced in large numbers, at the Focke-Wulf factory in Bremen, at the Bordeaux-Merignac aircraft factory (now the Dassault Mirage plant) in occupied France, then in the Aero Vodochody aircraft factory in Prague, occupied Czechoslovakia. Total production was 864 aircraft of all variants. Called the "Flying Eye" of the German army, the Fw 189 was used extensively on the Eastern Front with great success. Its Russian nickname was "Rama" (Frame), referring to its distinctive tailboom shape. Despite its slow speed and fragile looks, the Fw 189's maneuverability made it a difficult target for attacking Russian fighters. When attacked, the Fw 189 was often able to out-turn attacking fighters by simply flying in a tight circle into which enemy fighters could not follow. Its ruggedness was demonstrated when Fw 189s routinely returned to bases with one tail shot or torn off. The main production model was the Fw 189A reconnaissance plane, built mostly in two variants, the A-1 and A-2. Unless otherwise stated all aircraft were powered by two Argus As 410 engines of 465 PS (459 hp, 342 kW). Fw 189 A-0: 10 pre-production aircraft for operational tests and trials. Fw 189 A-1: Initial production version, armed with two flexible 7.92 mm (.312 in) MG 15 machine guns in the dorsal and rear positions, one 7.92 mm (0.312 in) MG 17 machine guns in each wing root, plus four 50 kg (110 lb) bombs. It could carry an Rb 20/30 or an Rb 50/30. Fw 189 A-1 Trop: Tropicalised version of the Fw 189 A-1, fitted with desert survival equipment. Fw 189 A-1/U2: VIP transport version of the Fw 189 A-1. Fw 189 A-1/U3: VIP transport version of the Fw 189 A-1. Fw 189 A-2: The flexible MG 15s were replaced by twin-barrel 7.92 mm (0.312 in) MG 81Z. Fw 189 A-3: Two-seat dual-control training aircraft. Built in small numbers. Fw 189 A-4: Light ground-attack version, armed with two 20 mm MG 151/20 cannons in each wing root, fitted with armour protection for the underside of the fuselage, engines and fuel tanks. The Fw 189B was a five-seat training aircraft; only 13 were built. Fw 189 B-0: Three pre-production aircraft. Fw 189 B-1: Five-seat training version. 10 built. The Fw 189C was conceived as a heavily-armoured ground-attack, close-support variant, but its two prototypes (V1b and V6) were not satisfactory, and it was not produced. Fw 189D: Proposed twin-float trainer floatplane. Not built. Fw 189E: Proposed version, to be powered by two 700 PS (690 hp, 515 kW) Gnome-Rhone 14M radial engines. Fw 189 F-1: Re-engined Fw 189 A-1 aircraft, powered by two 600 PS (592 hp, 441 kW) Argus As 411 engines. Fw 189 F-2: Fitted with electrically-operated landing gear, increased fuel capacity and additional armour plating, powered by two 600 PS (592 hp, 441 kW) Argus As 411 engines. One Fw 189 survives today. Its story starts on May 4, 1943 when Fw 189 V7+1H (Werk Nr. 2100) based at Pontsalenjoki took off on a mission to photograph the Loukhi-3 airbase from an altitude of 6,000 m (20,000 ft), then to continue north along the Murmansk-Leningrad railway. Approximately 31 minutes after taking off, V7+1H was attacked by Soviet Hawker Hurricane fighters. The aircraft dived to escape the fighters, but owing to damage already suffered, could not pull out in time, and it struck the treetops. The tail was torn off, and the crew nacelle left hanging upside down within the trees. The pilot, Lothar Mothes, survived but one crewman was killed in the crash and the third died from blood loss as a result of a severed leg. Incredibly, Mothes was able to survive two weeks in sub-zero temperatures, evading Soviet patrols while eating bark and grubs as he walked back to his base. Mothes spent the next nine months in a hospital recovering from severe frostbite before returning to the front lines to eventually fly another 100 missions. In 1991, the wreckage of V7+1H was found in the Russian forest where it had remained for 48 years. The aircraft was purchased by a group of British aircraft enthusiasts and was shipped to the UK, arriving in the town of Worthing, West Sussex in March 1992. The Focke Wulf 189 Restoration Society was formed to restore the aircraft to flying condition. Her pilot met up again with his aircraft in 1996 at Biggin Hill airshow. It has been reported that this aircraft has recently been acquired by Paul Allen’s Flying Heritage Collection. Brown, Capt. Eric (CBE, DSC, AFC, RN). Wings of the Luftwaffe. Garden City, NY: Doubleday & Company, Inc., 1978. ISBN 0-385-13521-1. Green, William and Swanborough, Gordon. "Das Fliegende Auge...Focke Wulf's Versatile Owl". Air Enthusiast, Thirty-seven, September-December 1988. Bromley, UK:Fine Scroll. ISSN 0143-5450. pp. 25-38. Kucera, Pavel. Focke-Wulf Fw 189 (bilingual Czech/English). Prague, Czech Republic: MBI, 1996. ISBN 80-901263-6-7. Punka, George. Focke-Wulf Fw 189 in Action (Aircraft Number 142). Carrollton, TX: Squadron/Signal Publications, Inc., 1993. ISBN 0-89747-310-8. Smith, J.Richard. Focke-Wulf, an Aircraft Album. Shepperton, Surrey, UK: IAn Allan Ltd., 1973. ISBN 0-7110-0425-0.